On March 23, 1913, Easter Sunday, a large majority of Ohio, the Niles area included, began to receive a large amount of heavy rain that lasted all night and all the next day without stopping. The rain, coupled with snow and ice that had been on the ground, caused flooding throughout the state. Smaller streams and rivers emptied into larger rivers, all finding their way to the Ohio River, causing it to crest at 69.9 feet on April 1st. Ohio, the Niles area included (due to flooding of Mahoning river and Mosquito Creek), suffered many losses, including 428 confirmed dead, and 20,000 homes destroyed. Damage exceeded $300,000,000. As a result, the US government began in depth studies into flood control. Locally, several dams were built to control the Mahoning River. The Ku Klux Klan was focused on Niles because of the Catholic population in the area. They had one march through town in May 1924, and then attempted another June 21st of that same year. This march was met with great resistance, and had to be canceled due to violence.The March was rescheduled for November 1 of that year, with an approved permit from the Mayor. The Anti-Klan group, the Knights of the Flaming Circle promised their own parade of 10,000. On October 29, the Mayor’s house was bombed, due to his refusal to revoke the permit. 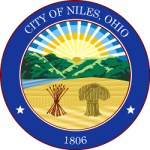 Tensions grew even tighter, and Niles gained national attention due to the impending marches. Despite the City’s pleas for assistance from the militia, they were denied. The result was 18 hours of full blown rioting. Control was brought to the town, requiring 10 days of martial law. Between both the Klan and Ani- Klan participants, 104 people were indicted. In 1937 the Steel Workers’ Organizing Committee, CIO attempted to force steel workers within “little” steel companies of the area to strike. Large numbers of workers of the Republic Steel Corporation refused and remained at work. The company could only get food and other necessary items to the employees through an airdrop method, all the while being shot at by strikers. Cargo often missed the nets set out to catch it, and was confiscated by police. The post office refused to deliver packages for the company. Workers left inside the building complained that they have been deprived of their rights by the union. After two men were killed the Governor put Trumbull and Mahoning Counties under martial law. The strike was finally broken by a back-to-work campaign. The Cafaro family builds the county’s first major shopping mall on route 422, introducing the concept of having many stores under one roof, and not having to go outside when traveling from shop to shop. On May 31, 1985, the City of Niles was struck by an F5 tornado that had its origins just West of Newton Falls, where it destroyed much of that town. It then moved through Lordstown and Warren, before wreaking havoc on Niles, where it toppled a skating rink and shopping mall, leveled dozens of houses, ripped through the Union Cemetery, injured many people, and took several lives. The tornado continued on, never leaving the ground until it reached Pennsylvania. In just the Niles area alone, 9 were killed, and 250 were injured. Nearly 70 homes were leveled and another 65 to 70 severely damaged. In the Mahoning and Shenango Valleys a total of 25 died and 500 people were injured, and there was $140 million in property damage. Coincidentally, the tornado of 1985 took a similar path through Niles as another tornado that hit in 1947. 7,100 seat stadium built behind the Eastwood Mall that houses the Mahoning Valley Scrappers, an AA Farm Team for the Cleveland Indians. The field also houses concerts with popular music groups. History of Niles, Ohio by The Niles Centennial History Club and McKinley High School, 1984, published by The Niles Daily Times. A Pictorial History of Niles, OH, 1976, Niles Bicentennial History Committee.